We think a lot about time as we transition from one year to the next. Was it a good year? Will I find more time to do the important things in the next? We are such busy people. Will God have room to enter into our fullness of time? I have a relative who is due to give birth in the in next month. Her pregnant shape gives added meaning to the fullness of time. When her time is full, the child will come. We each came into the fullness of our mother’s world. We each interrupted the normal. In the fullness of our own time, we will each exit this world. Unless the Lord returns before then. In the final getting up day, we shall all see the fullness of human history and its final transition to something new. Until then, we need to be mindful of the time that has been given to us to do thing of eternal value. Jim Collins’ book, Built to Last: Successful habits of Visionary Companies (Harper Business, 1994) speaks about how successful business leaders are “clock builders” as opposed to “time keepers.” That is, instead of merely trying to manage a situation, they set out to build a new reality. This new reality requires steady and selfless work. Flashy, manipulative, and creative individuals may achieve short-term success, and detail oriented, skillful managers may coach the maximum revenue out a lack luster situation, but neither brings about the systemic change that leaves an organization better than what it was before they came. Jesus birth into our world interrupts our fullness of time and introduces us to God’s plan. When we partner with what God is doing, we become spiritual clock builders. 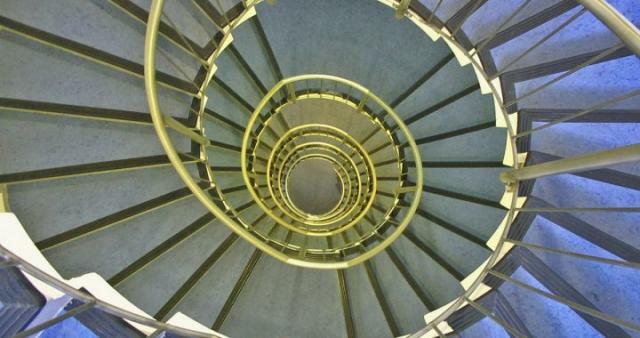 The spiral rule applies to our use of time as individuals. At every moment we can do what leads us inward (towards self-service) or what leads us outward (serving others). If we turn in, our use of time will lead us down into a dungeon of selfishness. If we turn out, our use of time will lead us higher and higher until we enter the fullness of God’s eternity.